One on One is a sitcom that aired on UPN. The show follows the lives of Flex Washington and his teenage daughter Breanna Barnes. The series begins with Breanna wanting to stay with her father, Flex, whom Breanna used to see only two weeks a year. When he blew out his knee during an NBA game, Flex had his communications degree to fall back on (which he revealed in a later episode he tried three times in order to get due to failing the class twice) and became a sportscaster. Flex works for the fictional WYNX-TV in Baltimore, resides in the ultimate bachelor pad, and lives the life of luxury. He is a ladies' man who wants to be both a responsible parent and a best friend to Breanna. Flex is very protective of his daughter, especially with boys. He has only had a couple of serious relationships, one of which was Breanna's mother Nicole Barnes, whom he impregnated at the age of 18. When Nicole takes a job in Nova Scotia, Nicole allows Breanna to live with Flex. Flex's best friend and Breanna's godfather, Duane Odell Knox, is a used car salesman who lives across the hall from Flex and Breanna and is a constant presence in their lives for better or worse. Duane's way with women is the exact opposite of Flex, in which Duane usually repels women. The women he does date, however, are somewhat unusual. Breanna's best friend is Spirit Jones with whom she creates some mischief. Her other best friend, Arnaz Ballard, is the object of her on-again, off-again affection. The two were just friends, but Breanna became jealous of Arnaz's old girlfriend. 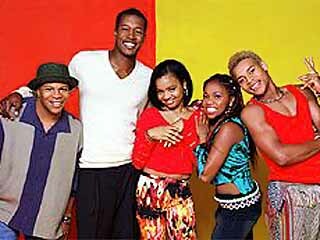 Arnaz became jealous when, in season two, Breanna started dating Josh. The two finally became a couple in the later part of the series. They break up during the third season and move on to date other people, even though they know they still love each other. This page was last modified on 1 June 2015, at 11:30.